Buongiorno, amici! Oggi voglio condividere questa card che ho realizzato con uno dei nuovi digi Sparkling Unicorn di Polkadoodles. 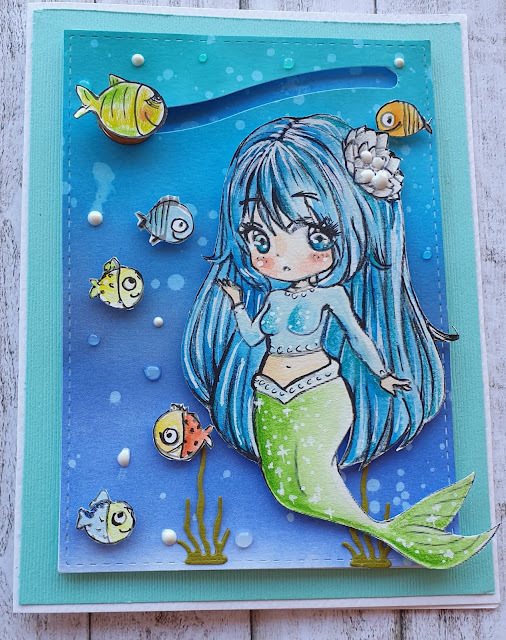 Ho colorato l'immagine con Gansai Tambi, Zig Clean Color e Prismacolor ; ho creato la cornice dello sfondo con Distress Oxide Broken China e Salty Ocean, ho tagliato con la fustella Rettangoli decorati de La Coppia Creativa infine ho aggiunto qualche tocco di Sharpie pen e Nuvo Drops. Morning, friends! 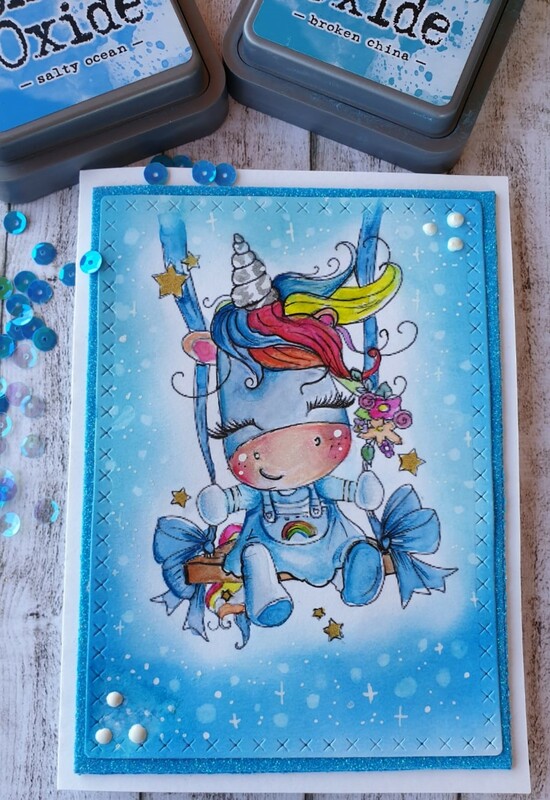 Today I'd like to share a card I made with new Sparkling Unicorn by Polkadoodles. 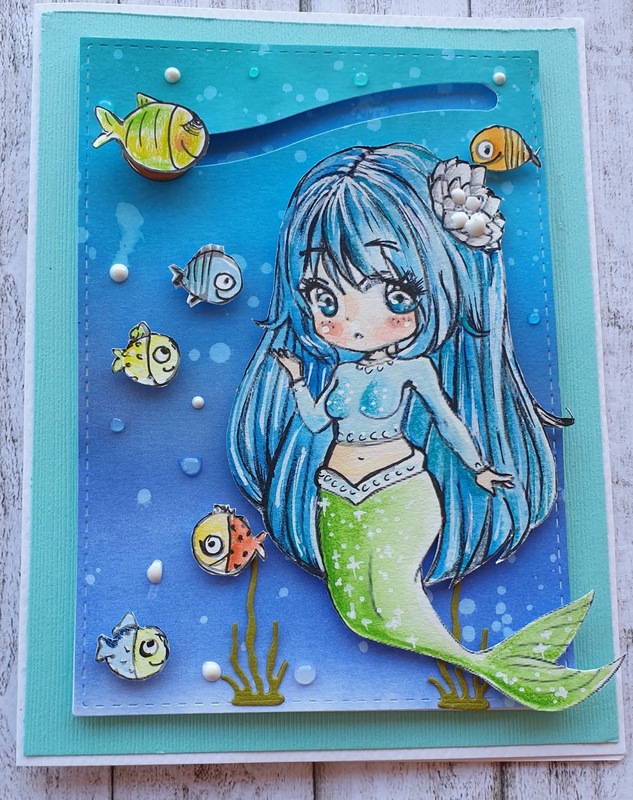 I coloured the image with Gansai Tambi, Zig Clean Color and Prismacolor ; I created the background with Distress Oxide Broken China and Salty Ocean, I cut it out with the die Rettangoli decorati by La Coppia Creativa and added some touches with Sharpie pen and Nuvo Drops. Sfida con sorpresa a The Crafting Challenge! Buongiorno, bloggers! Oggi inizia la nuova sfida a The Crafting Challenge con una novità! Sta arrivando la Pasqua e abbiamo pensato alle uova e soprattutto alla sorpresa… questo mese il tema è libero con l'opzione Pasqua! Vi aspetto sul nostro blog! 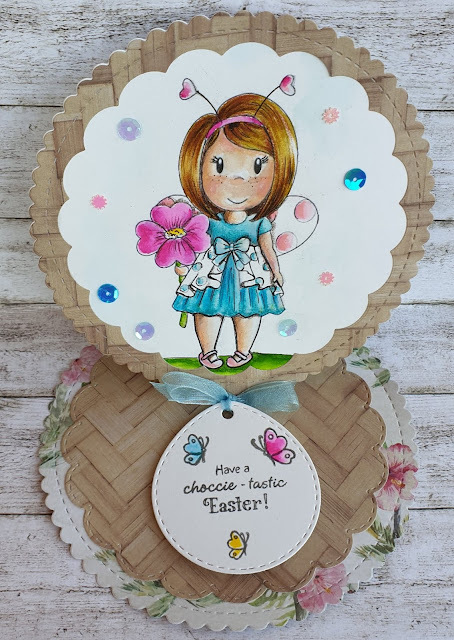 Unfortunately I couldn't get a Kraftin' Kimmie stamp and used a LeAnn's World digi coloured with Gansai Tambi and Prismacolor, I used Distress Oxide for the background and some die cuts from La Coppia Creativa. The fish are clear stamps and I drew the big she-fish myself. I added some dots with Nuvo Drops. Buongiorno, amici! 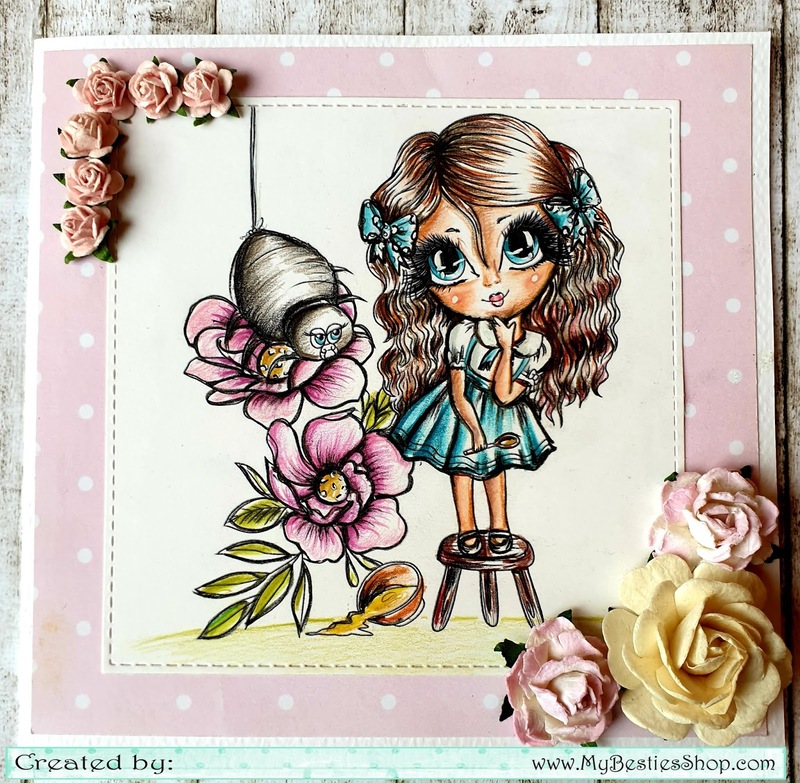 Oggi abbiamo una nuova sfida a Scrapbook Stamp Society challenge , il tema è semplicemente Anything goes con l'opzione Fiori . Purtroppo questa sfida è anche l'ultima perché il blog chiude, un enorme ringraziamento a Sherri Baldy e a Karin van Ejik che ha coordinato il DT per sei anni! Per la mia card ho scelto questa dolcissima Lil Miss Muffet colorata con matite Pablo. Ho creato la card con carta patterned e fustella de La Coppia Creativa poi ho aggiunto dei fiori. Good morning,friends! Today there's a new challenge going on at Scrapbook Stamp Society challenge , our theme is Anything goes option Flowers. Unfortunately this is also our last challenge as the blog is closing, huge thanks to Sherri Baldy and Karin van Ejik who has coordinated our DT for six years! Ciao a tutti! Oggi inizia la nuova sfida a The Crafting Challenge! Lo sponsor del mese è Crafty Sentiments designs come la simpatica bimba che ho colorato con Zig Clean Colour e Prismacolor e incorniciato con una fustella La Coppia Creativa ; per lo sfondo ho usato una carta patterned e per i banner una fustella di Modascrap. Come abbellimenti ho utilizzato delle enamel dots. Hi all! There's a new challenge on at The Crafting Challenge! For my card I used a Crafty Sentiments designs nice digi coloured with con Zig Clean Colour and Prismacolor and framed with a die cut from La Coppia Creativa ; I used a patterned paper for the background and a die cut by Modascrap for the banners. I added some enamel dots as embellishments. We are waiting for you on our blog! 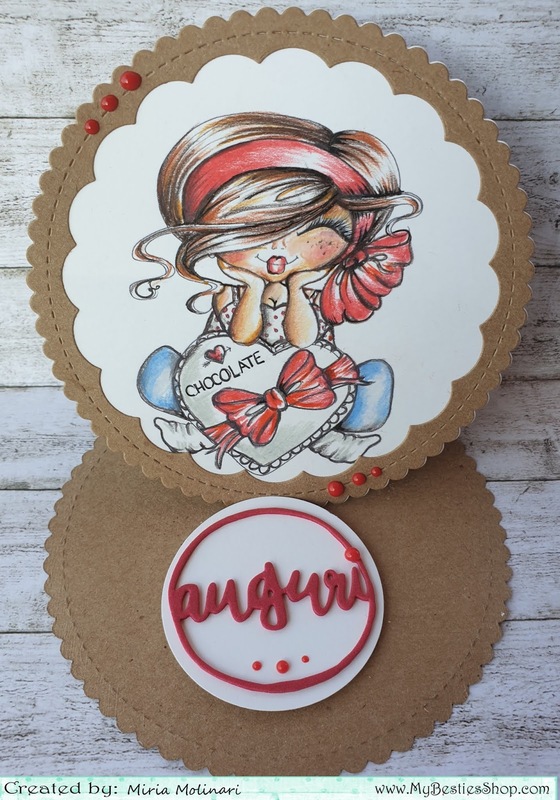 Eccomi con il mio progetto per Scrapbook Stamp Society challenge , il tema è Anything goes con l'opzione Non quadrato. Per la mia card ho scelto questa dolcissima Fluffy che ho colorato con le matite Prismacolor. Con l'immancabile fustella La coppia creativa, questa volta Cerchi creativi, ho realizzato una easel card e ho aggiunto il sentiment con una fustella Modascrap. Infine ho creato degli enamel dots con Nuvo Drops. 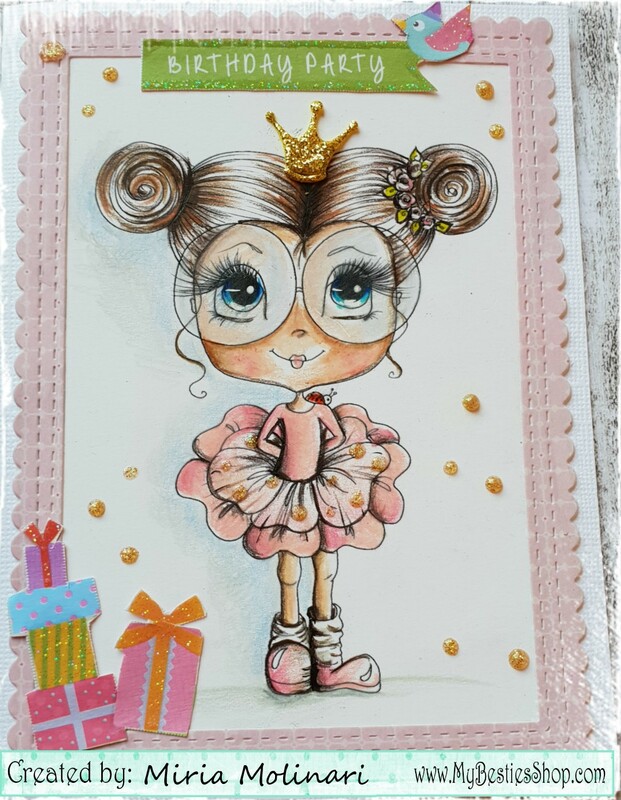 I'm back with my new project for Scrapbook Stamp Society challenge , our theme is Anything goes with option Not square. For my card I chose this sweet Fluffy , I coloured it with Prismacolor pencils. 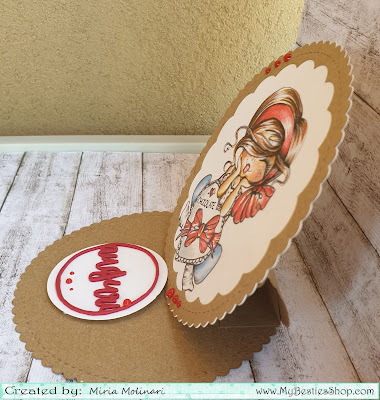 I used one of my fave die cut from La coppia creativa, Creative Circles, to make an easel card and added a sentiment with a die cut by Modascrap. I created some enamel dots with Nuvo Drops.